An ideal starting point for your Pittsburgh engagement photo session is, naturally, the heart of the city – Point State Park. Home of the famed “Golden Triangle” area, this popular Pennsylvania state park includes a pleasant expanse of well-manicured lawns, historic Revolutionary War era forts and the fountain – favored among picture-taking Pittsburghers and out-of-towners alike. This fountain sprays water from an underground river up to 150 feet in the air – the best place for multi-position shots of your engagement session. You and your photographer can create plenty of memorable photographs from the fountain area. Depending on your vantage point, you can select surroundings to fit your taste. Majestic, modern homes dot the Mt. Washington hillside – choose this background for added depth & dimension to your engagement photography. Are you and your partner sports nuts? Simply face south, where your photographer can include pictures of Heinz Field or PNC Park, home of the six-time Super Bowl champion Steelers and Pirates, respectively. Your photo shoot can also include the reigning Stanley Cup Champion Pittsburgh Penguins’ home, too – Mellon Arena is just a short jaunt through the center of the city. The arena is known for its retractable dome and is eligible for inclusion of the National Register of Historic Places. Back at the fountain, you can of course situate your snapshots to include the aforementioned Golden Triangle – Pittsburgh’s downtown area, with a unique blend of traditional & contemporary architecture. Stand at the old Fort Duquesne outline and face the fountain for truly memorable shots. Just a few of Pittsburgh’s photo-friendly, favorite pre-nuptial backdrops include the Gothic-style glass skyscraper PPG Place the soaring US Steel Tower and the famed Fifth Avenue Place. Once you’re satisfied with your Point State Park engagement photography, it’s time to reach new heights – literally – as your picture tour winds its way up to Pittsburgh’s Mt. Washington neighborhood Perched on a hilltop overlooking the Golden Triangle, this area captures the unique landscape, character and beauty that contribute to Pittsburgh’s perennial inclusion on “America’s Most Livable City” lists. Head across the Smithfield Street Bridge from downtown, catch East Carson street and turn west on PJ McArdle Roadway. This slowly meandering street eventually puts you several hundred feet above downtown and all three rivers – the Allegheny, Monongahela, and Ohio. Grandview Avenue is a great spot for your engagement photography – there are numerous “pull-off’ areas that provide an unforgettable environment for your Pittsburgh photo session – and any future bride and groom! Other excellent locales include the Duquesne and Monongahela inclines. These “hillside trains” have plenty of lookout area and open space for gorgeous shots of Pittsburgh. You’re literally on top of the city from these two inclines. Plus, as you’ll see soon, they’re a great place to embark on even more engagement photos – from a ground-level perspective. This neighborhood is well-known – much like Pittsburgh’s downtown – for its varied mix of architectural styles. Romanesque churches, contemporary homes and centuries-old buildings are just some of the breathtaking backdrops you’ll find as your celebratory snapshot session winds through the area. But no matter where your pictures are taken on Mt. Washington, you’re virtually assured of an album-worthy entry. Mt. Washington has been rated the most beautiful urban vista in the United States – and it’s easy to see why. Your hardest decision will be deciding which pre-wedding photos NOT to keep! From Mt. Washington, you can complete your snapshot schedule with an easy trip back toward Pittsburgh’s South Shore – incline-style! Board either the Duquesne or Monongahela incline. This slow-moving, single-track train puts you on the doorstep of another Steel City marvel. Pittsburgh’s Station Square area has an industrial past with a bright-looking future. 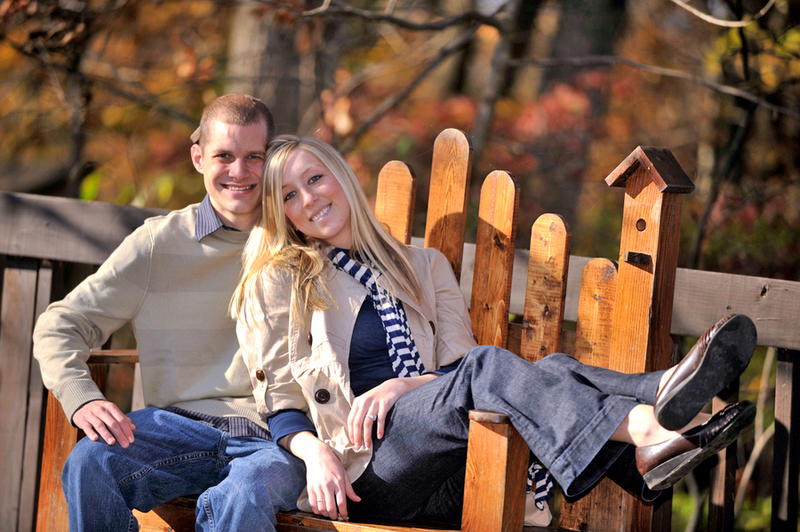 Your photographer has abundant backdrops to complete your engagement photo session. Try a shot with three of the city’s 446 bridges. The Fort Pitt, Smithfield and Liberty bridges show impressive scale and refined attention to detail. They’re favorite photo spots for a variety of events – including your engagement photography. Station Square is also a popular embarkation point for hitting the city’s three rivers. You can board the Pittsburgh Gateway Clipper Fleet for a leisurely trip around Point State Park. This is a great chance to capture the Allegheny River side of the Golden Triangle – a crucial component of any Steeltown picture agenda. Even a brief trip along the Allegheny makes you realize why Pittsburgh is called the City of Bridges. The Roberto Clemente and Rachel Carson bridges are just a few of the spans connection downtown Pittsburgh to the city’s North Side. The Gateway Clipper moves slowly enough for your photographer to focus on capturing festiveengagement photos. Enjoy Pittsburgh from a romantic, riverfront vantage point aboard one of the fleet’s five ships. The 1,000-passenger Majestic is a wise choice for your photo session; it has a spacious upper deck and extra room for achieving that perfect, sought-after snapshot.